I am no chef and I would like to start by letting you know a little bit about me. I am an avid baker and risk taker in the kitchen. I have been known to make some real masterpieces and am also known to have dumped an entire batch of something in the garbage because I tried a few too many spices in the same dish. I am by no means a professional baker, cook or chef. My passion for baking and cooking happened gradually over the years and I have learned most of what I know about cooking from family members along with trial and error. My knowledge of cooking also increased with the addition all those great cooking shows on TV. However, my basic skills where acquired from the 'elders' in my family. You know, those cooks who made the best Sunday dinners ever, the ones who could turn plain carrots into a gourmet meal? Well, they are the women and men that inspired me to become a better cook and baker. Hopefully you have had a chance to read my 'Which Flour is best for your recipe' wherein I expressed my true love for baking breads and bagels. Why you ask? I have no idea! It may be because it was a challenge that I was able to conquer. Or it might just be the satisfaction that I don't have to go to the store or bakery to get my bread or bagels. Or it could be the surprised look or that attention grabber when I say, "Oh I make all my own breads". Whatever the reason, I just love it. 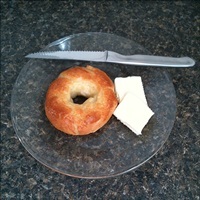 I have been improving and tweaking my bagel recipe for a very long time now. 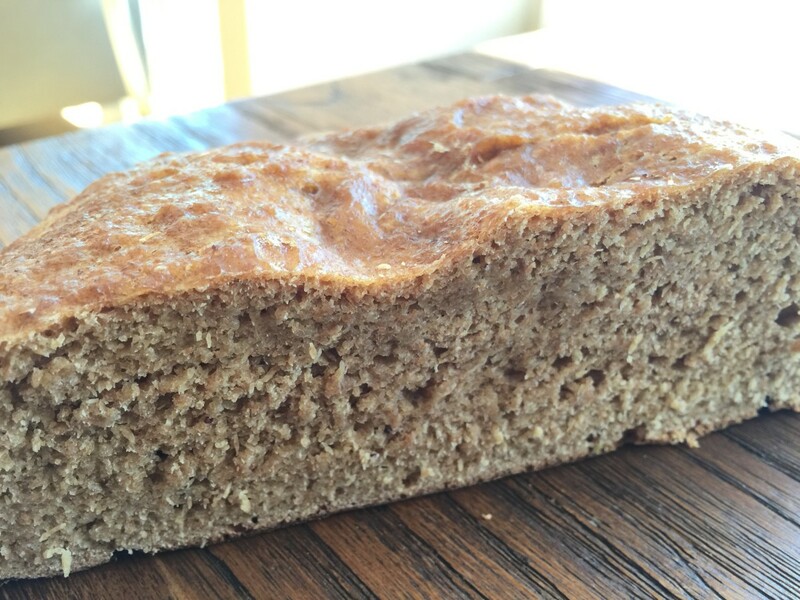 This recipe is the one that I think is the easiest with the fewest ingredients. I am going to share it with you along with a visual of the step-by-step instructions. 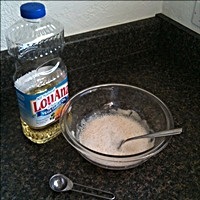 Combine hot water, sugar and yeast in a glass bowl. Stir ingredients with a fork, then cover with a towel. 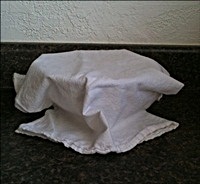 Cover the wet yeast mixture with a towel and let stand for 10 or 15 minutes. Note: I only use flour sack towels. I find that because they have such a tight thread weave that they really hold in the warmth so your yeast rises and you also don't get fuzzies in your dough that might get stuck on a regular dish towel. The yeast, sugar and water mixture will have expanded in size and be bubbled when it's finished resting. Add the oil to the wet ingredients and blend it in well with a fork. Note: This is an important step! If you try to add the oil after you have added the flour, you will have a sticky mess to work with. It will also be difficult to incorporate all the flour. 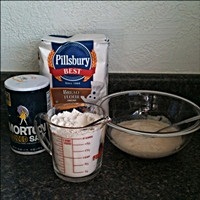 Measure out the flour and put in the salt. 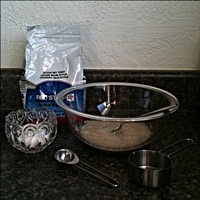 Gradually add the flour and salt mixture to the wet mixture, mixing it in with a fork. When you can no longer mix it with a fork, get your hands in there and work it all together! 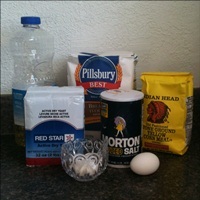 Note: Make sure that the salt is pre-mixed with the flour before you put it in the wet mixture. SALT should never directly touch yeast. Lightly flour your work surface. 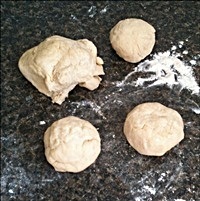 Put your dough on your work surface and knead it for approximately 7-8 minutes. Note: Don't let the 'kneading' part scare you away. 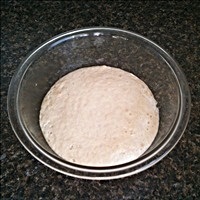 Knead the dough by flattening or rolling out your dough, grip the sides, flip them inward, press them down, flap the top downward and bottom upward, press down, and then go to the sides again. Repeat several more times and that's it. 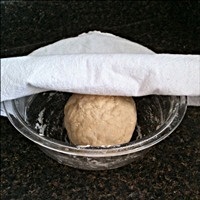 When you have finished kneading your dough, roll it into a large ball, put it back in the glass bowl and cover it with your towel. 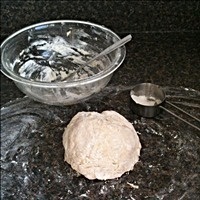 Let the dough stand for 30 to 40 minutes while it rises. Note: Do not disturb during this process. 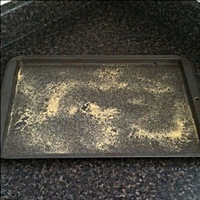 While your dough is rising (resting), take a cookie sheet and lightly coat it with cornmeal. 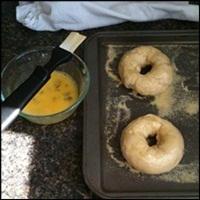 Note: The cornmeal is necessary in order to keep your bagels from sticking while baking. 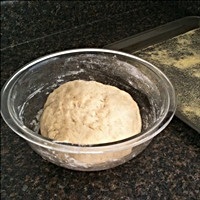 After 30 to 40 minutes of resting, your dough will have almost doubled in size. 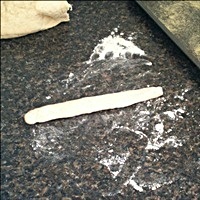 Punch down the dough, (which means, poke a whole to release the air) and fold it out onto your lightly floured work surface. 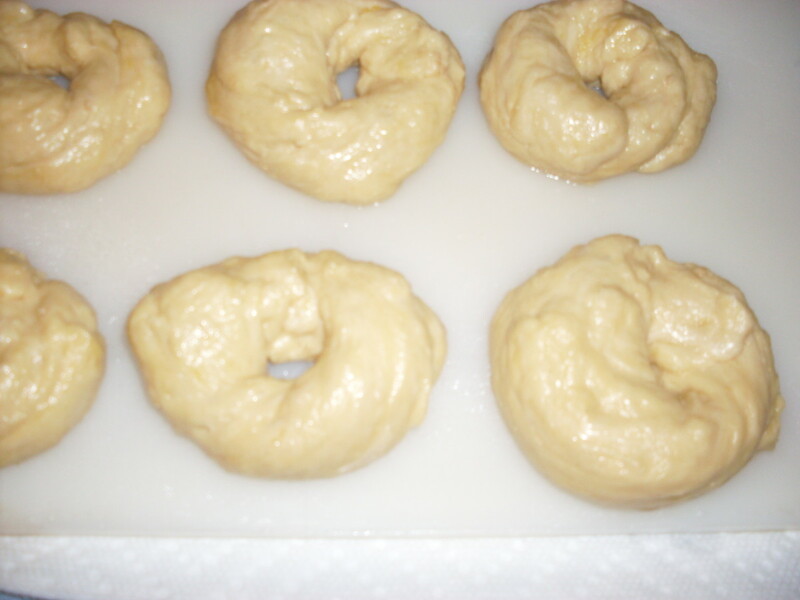 Depending on the size of the bagels you want to make, divide the dough into into 6 to 8 equally sized pieces. There are a few different ways to form your bagels. One way is to roll out balls and slightly flatten them, then place them on the cornmeal dusted cookie sheet. Note: The bagel 'hole' part comes later right before parboiling. The standard way to make a bagel shape is to roll out an approximately 8" inch tube or snake shape. Take the 8" snake and then loop it so that it forms a ring. Bring both ends together and pinch to join it. 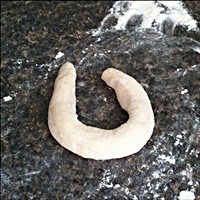 Some people add a little knot at the end by folding one end of the dough over the other end and tucking the ends under. Put a very small amount of water at the joined area to seal the dough. 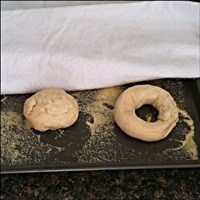 Place the shaped bagels on the cornmeal dusted cookie sheet. Here are both the ring style and the ball style. The ring style are your basic bagels. To make the hole in the ball or flattened style, poke a hole down in the center of the dough with your thumb and tuck it under the bottom of the ball. You can do this before you let them rise again or before you parboil them. 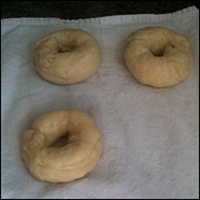 Cover the bagels with your towel and let stand for 30 to 40 minutes. The bagels will once again almost double in size. Note: After your bagels have set for approximately 20 minutes, fill a frying pan with water, 1/2 full, and begin to boil. If you did not poke the hole in the ball style bagels yet, do that now. Now that your bagels have set, and all have holes, carefully take them from your cookie sheet and parboil each for 1 1/2 to 2 minutes on each side. Note: Parboiling is between a full boil and a simmer. The bagels will be slippery so I use a slotted spatula and a wooden spoon while handling the bagels. When each bagel has been parboiled on both sides, carefully remove the bagels from the water and place them on the towel. Gently pat dry each bagel on both sides. Note: For crustier bagels, put a small metal baking pan filled with water on the bottom of your oven. 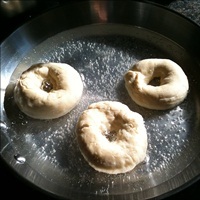 The steam will help crisp up the outside of your bagels. Put your oven rack on the lowest setting and preheat your oven to 400*. Place the dried bagels back onto your cornmeal dusted cookie sheet. Lightly egg wash each bagel. Note: My egg wash is a really well whisked egg with just a TAD of water. Place the baking sheet on the bottom rack of the oven for 15 to 25 minutes or until the top of your bagels are medium golden brown on top. 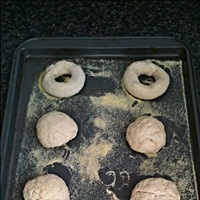 As you can see, the rolled snake method (the two bagels in the front) are not that much different than the ball and thumb method (the two bagels in the back). The bagels in the center are preferred by my grandson, no hole at all! I am so glad you tried them! Yes a little adjustment here and there might be in order. Thanks for letting me know. Well, I made them. They are absolutely delicious. I did have to add more water than called for in the recipe, but that could be because I live in a low humidity area (the desert of Las Vegas). Congratulations! A well-written hub and seems like very good bagels. I shall try soon. Yes, it is a small batch. It is my ritual each week...I look forward to making my weekly bagels. I only freeze a very few things, I prefer fresh whenever I can get it. 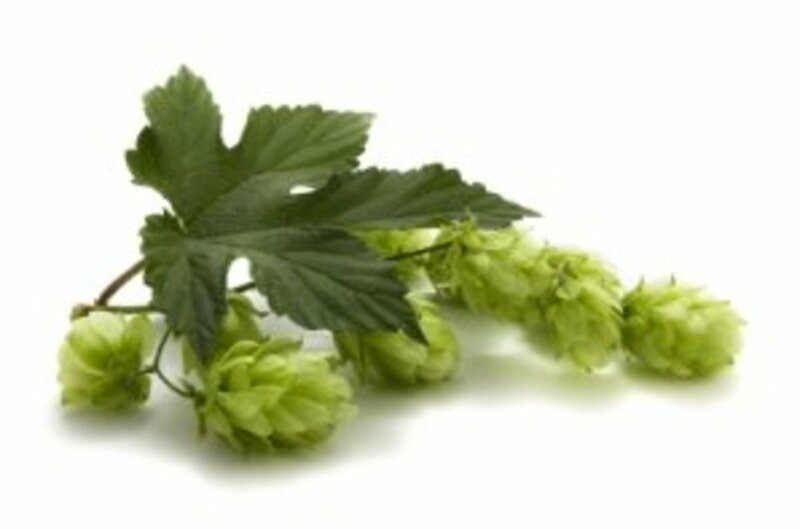 They look great, but what a tiny batch. 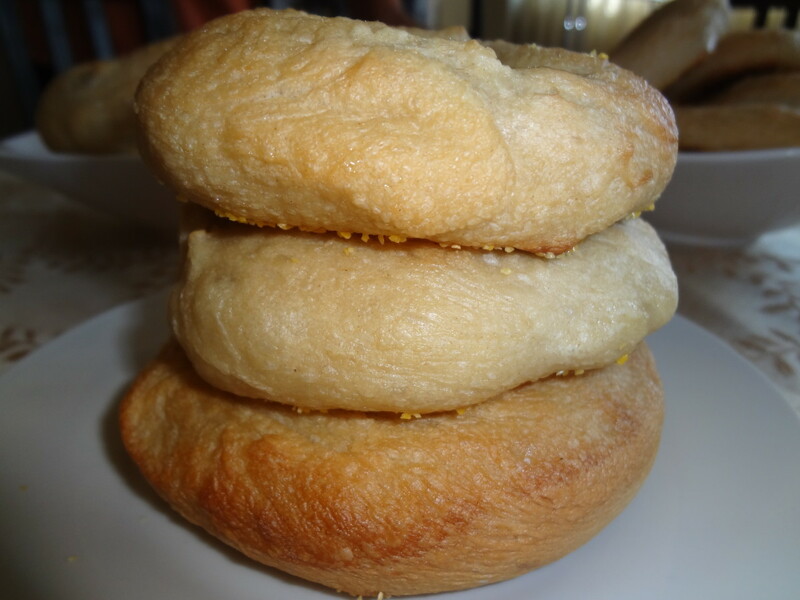 Whenever I have made bagels, I make a HUGE batch and make some sesame, some poppy seed, some onion, etc. A freezer is a girl's best friend. Awesome! 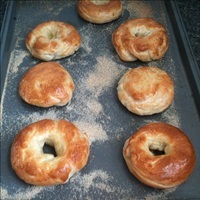 I've never thought about making my own bagels, but now I will! I love baking, so I'm definitely going to give this a shot. Fantastic hub, by the way. Congrats on the hubnugget nomination! Well deserved. I voted for you, so good luck. I'm quite like you- I love to cook and bake, and I'm a huge fan of the Food Network, but I have made a bunch of big mistakes in my day! I therefore totally trust your instructions- you're the real thing! You've DONE it and survived to tell the story! I've never made bagels before, but I eat them daily and would love to give this whole endeavor a go. Thanks for inspiring me! 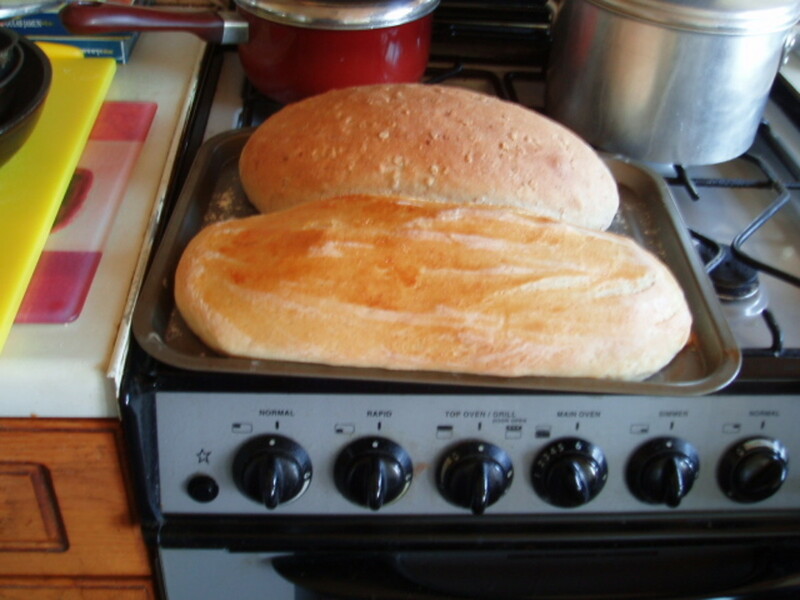 great hub, I too am a baking adict and just love the thrill of getting fresh bread from the oven. Well done I enjoyed reading your recipe. cheers I've voted you up too for your efforts. Thank you, I appreciate your interest. What a fabulous presentation of a really wonderful recipe. You did an awesome job. I just wanted to pluck one of those bagels out and eat it right now! A very thorough detailed set of instructions. I may just have to try this sometime. I love good baegels but they seem to make them too puffy and airy here in the midwest. They seem to think that bigger is better. I'm gonna have to try that. 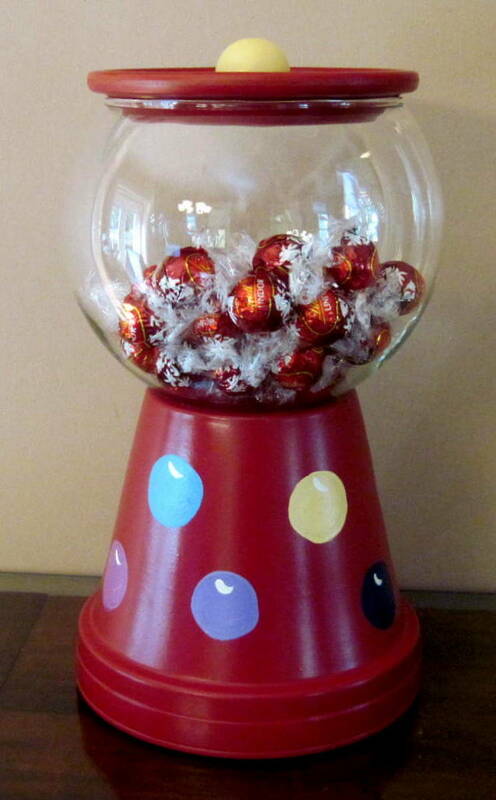 Miss the days when you could buy them for a few cents at the bakery stores. Now they are $2+ for six of them!